On February 5, 2018, the Dow Jones Industrial Average fell nearly 1,600 points, the biggest drop in its history. By the close of trading, it had recovered a bit, and the next day, the Dow closed up 2%. This upheaval followed months of steady climbs to record highs for stock exchanges in the US and elsewhere. It will take economists and analysts a while to know if this was a correction, the start of a slide, or was the result of computer-driven trading activity. Whatever the reasons, the experts say there is no reason to panic. But it is a good reminder of the cardinal rule of investing: diversify. Putting all of your eggs in one basket, whether it is stocks, bonds, real estate, or pork belly futures, is never a good idea. That is doubly true for your retirement nest egg, and trebly true for people who are closer to retirement age. The last group, in particular, has fewer years to rebuild losses sustained in a volatile market. Diversification in your investments protects you from risk. All markets – equities, bonds, precious metals, real estate, commodities – don't always move in sync. When the stock market is hot, bonds may be cool. Precious metals often move in opposition to equities. Real estate values may soar in one region, and struggle elsewhere. Even within the equities market, it pays to diversify your holdings across a spectrum of industries. A portfolio invested only in tech companies or consumer goods or health care leaves you open to a crash in that sector. Similarly, the market can react differently to large-cap companies and small-cap companies. Because large companies typically have more that one line of business, they are more protected from market shifts. A small-cap company making only widgets will have a harder time recovering if the bottom falls out of the widget market. The ability to diversify your retirement savings is an obvious advantage of self-directed accounts. Most banks and brokerages limit your ability to diversify. True, you may have a choice of equities, bonds, and funds, and a variety of investment strategies and risk profiles. But you are unlikely to be able to invest in real estate, alternative assets, or precious metals, for example. With a self-directed IRA, you have that freedom. The Entrust Group is a pioneer in the self-directed IRA space. Rather than tell you what to invest in, we make it easy for you to invest in the assets of your choice. We take care of the transaction processing, IRA reporting, and other administrative responsibilities. 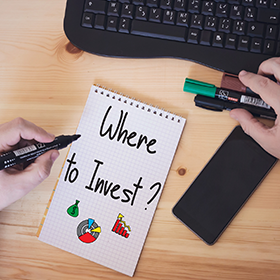 Plus, we make it our job to help you become a more aware investor by providing a wealth of educational opportunities through our Learning Center. Opening a self-directed IRA with Entrust is easy. It takes a mere 10 minutes online. And if you do it during our promotion, it’s free!